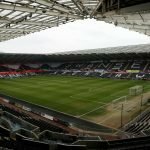 Saturday’s home game against Nottingham Forest saw Graham Potter’s Swansea City side play out a goalless draw at the Liberty Stadium – a result that they were probably happier with after managing long spells of Forest possession as they struggled up against the visitor’s physical approach. Our first-half pass map below shows a lot of our possession being played in our own half and in wide areas with very little play going through the middle. Forest pressed us high up the pitch, forcing us into wide areas where they often congested these areas allowing them to steal the ball in decent positions. 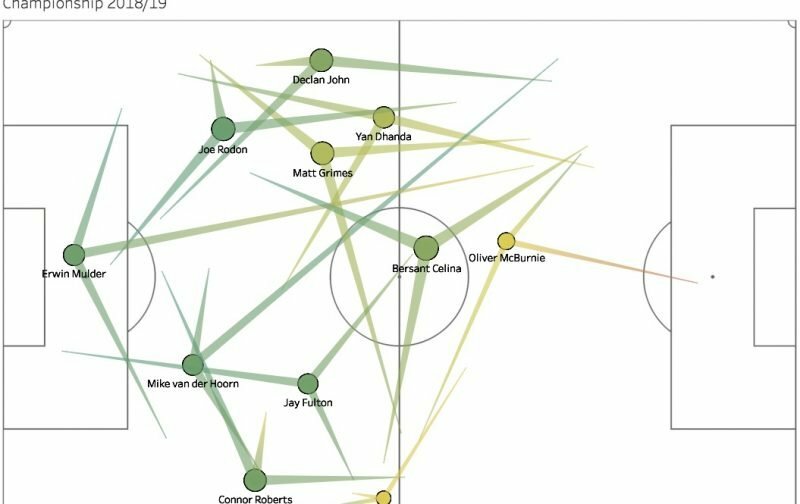 There was good passing accuracy amongst the back 5 as shown below via the darker green colours while the likes of McBurnie and McKay were inactive and poor with their passes. The team were split into two groups of four either side of the pitch in terms of passing with two quartets of Rodon, John, Grimes and Dhanda, and van der Hoorn, Fulton, Roberts and McKay on the right. The pass map below shows the attacking phase of Swansea’s passing play. Both McBurnie and Celina operated on the left to assist Dhanda and John who did struggle in the early part of the first half. Celina’s move to the left might skew his position below slightly. On the right flank, Roberts didn’t push as far up the pitch as his opposite number, Declan John did and there was a lack of support down that side compared to the left. The main difference between Swansea’s possession play in the first period of the second half compared to the entire first half is how much further forward they played. They created an half-decent goalscoring chance within the first minute or so of the second half having struggled to create much before the break. McKay’s passing accuracy improved compared to the first half and a number of players are now averaging passing position’s in Forest’s half. Joel Asoro came on and mostly played through the middle with McBurnie shifting across to the left – likely to add better defensive cover down that side. The attacking (high) phase map isn’t available due to a lack of data available in the high phase. The overall, average map above gives the best overview of our passing and due to us playing further up the pitch, there wasn’t any significant passes to create another map. Asoro also lacks any passing arrows because of his lack of passes during this 22-minute period.